Thatch dilution is one of the big claims often made for the efficacy of sand top-dressing, but what does that mean? The thinking here is that due to the continuing production of thatch by the grass plants, in order to ensure that our rootzone (top-soil) continues to build up as a uniform, homogenous medium, we need to add a layer of sand for the organic material to mix with from time to time. 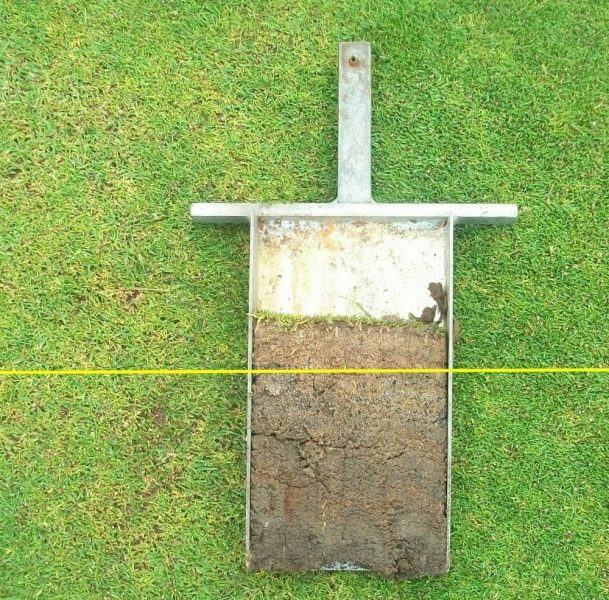 This idea, although well intentioned in every case, is dangerously inaccurate in terms of soil science and invariably leads to poor bowls green performance caused by thick, matted thatch. Mistake number 2: That soil Organic Matter is the same as the non-sand component of topsoils/rootzones. Recently deposited/fresh Organic Material, such as dead grass roots, stolons, shoots, animal droppings etc, that has still to be processed by the soil organisms and microbes. Thatch is in this category. 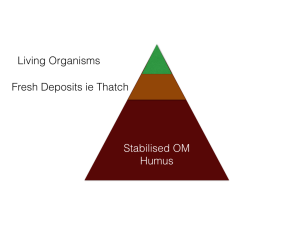 Stable Organic Matter that has been fully recycled/decomposed and is now Humus. Mixing sand with humus to create a nicely balanced, homogenous topsoil (not necessarily a good idea as a rootzone for sportsturf) is actually a reasonable idea, but mixing sand with un-decomposed thatch is never a good idea and will result in a thick, dense, impenetrable mat on top of the green. When thatch becomes matted like this, it can’t be broken down by the soil organisms and simply gets thicker, denser and more troublesome as time goes on. In an earlier article I described the make up of rootzones for bowls greens and you might recall that there are various fractions within the soil which are defined mainly by their particle size. It is essential to have around 10% fines by weight (mostly clay and silt) within the mineral component of the rootzone to help provide water and nutrient holding capacity. The thatch dilution theory confuses these fines with Organic Matter and assumes that sand plus thatch equals a good rootzone; it doesn’t. Organic Matter is a critical component of a lively, healthy rootzone, but it can’t replace the fines such as silt and clay. In any case, un-decomposed thatch is not Organic Matter, but organic Material awaiting processing by the soil life and microlife. Hi John we have used our verti cutter to rake out thatch, we stopped after after 5 times going over the whole of the bowling green. This seems to have improved the green pace but it didn’t take out the blackened moss. The verti-cutter blades are designed for cutting through lateral growth and as such won’t be well suited to removing dead moss. You might want to try your scarifier if you have one, or a wire rake if you don’t. Take it easy though. Hi John, following core sampling we have up to two inches of thatch in the wetter area of our green, the thatch is sour smelling and moss is more of a problem there as well. We were told that the soil registered as acidic. To try to tackle this we have scarified four times since April, have fertilised four times, early season with granular Spring/Summer feed and last two with liquid feed. We plan to hollow tine, deep scarify, overseed, top dress, deep aerate (4-5 inch chisel tines) and apply Calcifert starting late September (after season ends) through into October. We want to help reduce the thatch thickness, correct the acidity and promote healthy grass growth, is what we plan likely to help, are we missing anything, what mix of top dress should we use (we can get 70:30 thru to 50:50) and do you know of anyone in the East Lancs area who will visit greens and give truly independent advice, paid for of course? The acidity will be part and parcel of the thatch and the associated compaction and anaerobic conditions. When you deal with the thatch and compaction, the soil pH will stabilise quite quickly. Regarding the correct program, you should probably leave out the top dressing and switch from a standard scarifier to something like the Graden GS04 after hollow tining at 2″ centres with jumbo (5/8″) tines. This will remove around 20% of the green surface (thatch), introduce a huge volume of air and get your microbes working on the thatch that remains. You might well have to repeat this next year. If your green also has Localised Dry Patch, it would be wise to apply a granular wetting agent as well. Twice monthly deep slit tining (Sisis Autoslit or similar) October to March. Further Carbohydrate applications monthly as above during winter. Spot treatment of disease outbreaks with curative fungicide: no blanket or preventative treatments if at all possible. Regarding local advice, I don’t know anyone in your area who would give you the right advice. The majority of advisers will tell you to throw lots of sand on your green and in most cases this is detrimental to green condition. If you can let me know a bit more about your findings when you do soil profiles, I can advise further.